The gorgeous and evocative Otto Schenk/Günther Schneider-Siemssen production continues with this second opera in Wagner’s Ring cycle. Hildegard Behrens brings deep empathy to Brünnhilde, the favorite daughter of the god Wotan (James Morris) who nevertheless defies him. Morris’s portrayal of Wotan is deservedly legendary, as is Christa Ludwig, as Fricka. 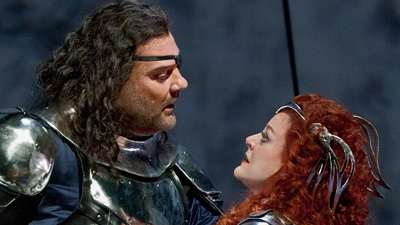 Jessye Norman and Gary Lakes are Sieglinde and Siegmund, and Kurt Moll is the threatening Hunding. James Levine and the Met orchestra provide astonishing color and drama.